The purpose of this study was to enhance grade 11 students’ conceptual understanding of fundamental acid-base models using Predict-Observe-Explain based animated movies (POE-AM). Twelve grade 11 students participated in the study. To collect data, the students’ responses to the POE-AM tasks and interview protocols were used. The findings indicated that the POE-AM tasks positively improved the students’ conceptual understanding of fundamental acid-base models and remedied any deficiency identified in pre-interviews and/or the ‘predict’ stage of the POE strategy. The results also showed that before implementation the students stated the main parts of acids and bases as H+ and OH- ions, respectively. After the implementation, they indicated that the Arrhenius model had the least adequate explanation to imply features/behaviors of acids and bases whilst the Lewis model did the most adequate acid-base definition to address their features/behaviors. Moreover, the study revealed that most of the students had alternative understanding or only partial understanding at the ‘predict’, but showed somewhat a sound understanding of these concepts at the ‘observe’ and ‘explain’ stages. The current study suggests that chemistry teachers should integrate the POE-AM into their classes to effectively promote student learning. Bu çalışma, 11. sınıf öğrencilerinin temel asit-baz modelleriyle ilgili kavramsal anlamalarını Tahmin-Gözlem-Açıklama temelli animasyon filmleriyle (TGA-AF) artırmayı amaçlamaktadır. Çalışmaya 12 onbirinci sınıf öğrencisi katılmıştır. Veri toplamak için öğrencilerin TGA-AF etkinliklerine ve mülakat protokollerine verdikleri cevaplar kullanılmıştır. Elde edilen bulgular, TGA-AF etkinliklerinin öğrencilerin temel asit-baz modelleriyle ilgili kavramsal anlamalarını pozitif olarak geliştirdiğini ve ön mülakatlarda ve/veya TGA stratejisinin tahmin aşamasında belirlenen eksiklikleri giderdiğini göstermiştir. Öğrenciler uygulamadan önce asit ve bazların temel bölümlerinin sırasıyla H+ ve OH- iyonları olduğunu ifade etmiştir. Uygulamadan sonra ise öğrenciler asit ve bazların özelliklerini ve davranışlarını açıklamak için Arrhenius modelinin en az ve Lewis modelinin ise en çok yeterli açıklamaya sahip olduğunu belirtmişlerdir. Ayrıca, öğrencilerin çoğunluğunun TGA’nın “tahmin” aşamasında alternatif ya da kısmi anlamaya sahip olduğu; ancak, “gözlem” ve “açıklama” aşamalarında belli bir dereceye kadar tam anlamayı gösterdikleri ortaya çıkmıştır. Bu çalışma, kimya öğretmenlerinin öğrencinin öğrenmesini etkili olarak teşvik etmek için TGA-AF’yi kendi sınıflarına entegre etmelerini önermektedir. Abdullah, A., & Scaife, J., (1997). Using interviews to assess children’s understanding of science concepts. School Science Review, 78, 285, 79-84. Abraham, M. R., Grzybowski, E. B., Renner, J. W., & Marek, E. A. (1992). Understandings and misunderstandings of eighth graders of five chemistry concepts found in textbooks. Journal of Research in Science Teaching, 29, 105–120. Artdej, R., Ratanaroutai, T., Coll, R. K., & Thongpanchang, T. (2011). Thai grade 11 students’ alternative conceptions for acid–base chemistry. Research in Science & Technological Education, 28(2), 167-183. Bağ, H. & Çalık, M. (2017). A thematic review of argumentation studies at the K-8 level. Education and Science, 42(190), 281-303. Bahar, M., & Tongaç, E. (2009). The effect of teaching approaches on the pattern of pupils’ cognitive structure: Some evidence from the field. The Asia Pacific Education Researcher, 18(1), 21-45. Bakırcı, H., Çalık, M. & Çepni, S. (2017). The effect of the common knowledge construction model-oriented education on sixth grade pupils’ views on the nature of science. Journal of Baltic Science Education, 16(1), 43-55. Barak, M., Ashkar, T., & Dori, Y. J. (2011). Learning science via animated movies: Its effect on students’ thinking and motivation. Computers & Education, 56(3), 839-846. Çalık, M., Ayas, A. & Coll, R. K. (2007). Enhancing pre-service primary teachers’ conceptual understanding of solution chemistry with conceptual change text. International Journal of Science and Mathematics Education, 5(1),1–28. Çalık, M., Ayas, A. & Coll, R.K. (2009). Investigating the effectiveness of an analogy activity in improving students’ conceptual change for solution chemistry concepts. International Journal of Science and Mathematics Education, 7(4), 651-676. Çalık, M., Kolomuç, A. & Karagölge, Z. (2010). The effect of conceptual change pedagogy on students’ conceptions of rate of reaction. Journal of Science Education and Technology, 19, 422–433. Çalık, M., & Cobern, W. W. (2017). A cross-cultural study of CKCM efficacy in an undergraduate chemistry classroom. Chemistry Education Research and Practice, 18, 691-730. Çalik, M., Ebenezer, J., Özsevgeç, T., Küçük, Z. & Artun, H. (2015). Improving science student teachers' self-perceptions of fluency with innovative technologies and scientific inquiry abilities. Journal of Science Education and Technology, 24(4), 448-460. Çalik, M., Özsevgeç, T., Ebenezer, J., Artun, H. & Küçük, Z. (2014). Effects of 'environmental chemistry' elective course via technology embedded scientific inquiry model on some variables. Journal of Science Education and Technology, 23(3), 412-430. Carr, M. (1984). Model confusion in chemistry. Research in Science Education, 14, 97–103. Cartrette, D. P. & Mayo, P.M (2011). Students’ understanding of acids/bases in organic chemistry contexts. Chemistry Education Research and Practice, 12(1), 29−39. Cooper, M., Kouyoumdjian, H. & Underwood, S. U. (2016). Investigating students’ reasoning about acid-base reactions. Journal of Chemical Education, 93, 1703-1713. Coştu, B., Ayas, A., & Niaz, M. (2012). Investigating the effectiveness of a POE-based teaching activity on students’ understanding of condensation. Instructional Science, 40,47-67. Creswell, J. W., & Plano Clark, V. L. (2011). Designing and conducting mixed methods research. Thousand Oaks, CA: Sage Publications, Inc.
Drechsler, M., & Schmidt, H.-J. (2005a). Upper secondary school students’ understanding of models used in chemistry to define acids and bases. Science Education International, 16, 39–54. Drechsler, M., & Schmidt, H.-J. (2005b). Textbooks’ and teachers’ understanding of acid–base models used in chemistry teaching. Chemistry Education: Research and Practice, 6, 19–35. Drechsler, M., & Van Driel, J. (2008). Experienced teachers’ pedagogical content knowledge of teaching acid-base chemistry. Research in Science Education, 38(5), 611–631. Er Nas, S., Calik, M. & Cepni, S. (2012). Effect of different conceptual change pedagogies embedded within 5E model on grade 6 students’ alternative conceptions of ‘heat transfer.’ Energy, Education, Science and Technology Part B Social and Educational Studies, 4(1), 177-186. Er Nas, S., & Çalık, M. (2018). A cross-age study of science student teachers’ conceptual understanding of soil erosion. Problems of Education in the 21st century, 76(5), 601-619. Hawkes, S.J. (1992). Arrhenius confuses students. Journal of Chemical Education, 69, 542-543. Justi R.S, & Gilbert, J.K. (2002). Modelling, teachers’ view on the nature of modeling, and implications for the education of modelers, International Journal of Science Education, 24(4), 369-387. Kala, N., Yaman, F. & Ayas, A. (2013). The effectiveness of predict–observe–explain technique in probing students’ understanding about acid-base chemistry: A case for the concepts of pH, pOH and strenght. International Journal of Science and Mathematics Education,11(3), 555-574. Karslı, F. & Çalık, M. (2012). Can freshman science student teachers’ alternative conceptions of ‘electrochemical cells’ be fully diminished? Asian Journal of Chemistry, 24(2), 485- 491. Kearney, M., & Treagust, D.F. (2001). Constructivism as a referent in the design and development of a computer program which uses interactive digital video to enhance learning in physics. Australian Journal of Educational Technology, 17(1), 64–79. Kearney, M., Treagust, D., Shelley Y., & Zadnik M. (2001). Student and teacher perception of the use of multimedia supported predict- observe- explain task to probe understanding. Research in Science Teaching, 31, 539- 615. Kiryak, Z. & Çalik, M. (2018). Improving grade 7 students’ conceptual understanding of water pollution via common knowledge construction model. International Journal of Science and Mathematics Education, 16(6), 1025-1046. Kousathana M., Demerouti M., & Tsaparlis G. (2005). Instructional misconceptions in acid base equilibria: An analysis from a history and philosophy of science perspective. Science and Education, 14, 173-193. Liew, C. W. (1995). A predict-observe-explain teaching sequence for learning about students’ understanding of heat. Australian Science Teachers Journal, 41(1), 68- 72. Liew, C. W., & Treagust, D F. (1998). The effectiveness of predict-observe-explain tasks in diagnosing students’ understanding of science and in identifying their levels of achievement. Paper presented at the Annual Meeting of the American Educational Research Association, April 13-17, San Diago. Mayer, R. E. (2002). Cognitive theory and the design of multimedia instruction: An example of the two-way street between cognition and instruction. In D. F. Halpern, & M. D. Hakel (Eds. ), Applying the science of learning to university teaching and beyond (pp. 55–72). San Francisco: Jossey-Bass. MONE (Ministry of National Education) (2013a). Science and technology curriculum for grades 5-8. Ankara: MEB Publishing. MONE (Ministry of National Education) (2013b). Chemistry curriculum for grades 9-12. 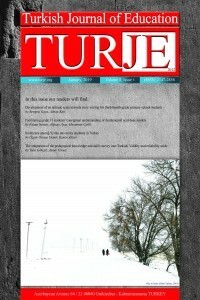 Ankara: MEB Publishing. Osborne R.J., & Cosgrove M.M. (1983). Children's conceptions of the changes of states of water. Journal of Research in Science Teaching, 20, 825-838. Tarhan, L., & Acar-Sesen, B. (2008). An application of jigsaw cooperative learning for understanding “acid-base theories.” Paper presented at the XIII. IOSTE, İzmir, Turkey. Tarhan, L., & Acar-Sesen, B. (2012). Jigsaw cooperative learning: Acid-base theories. Chemistry Education Research and Practice, 13(3), 307-313. Ültay, N. & Çalık, M. (2016). A comparison of different teaching designs of ‘acids and bases’ subject. Eurasia Journal of Mathematics, Science & Technology Education, 12(1), 55-86. White, R.T., & Gunstone, R.F. (1992). Probing understanding. Hong Kong: Graphicraft ltd.
Zoller, U. (1990). Students' misunderstandings and misconceptions in college freshman chemistry (general and organic). Journal of Research in Science Teaching, 27(10), 1053-1065.